Figure A. FITC conjugated mouse anti human CD14 (MCA596F) and RPE conjugated mouse IgG1 isotype control (MCA928PE). 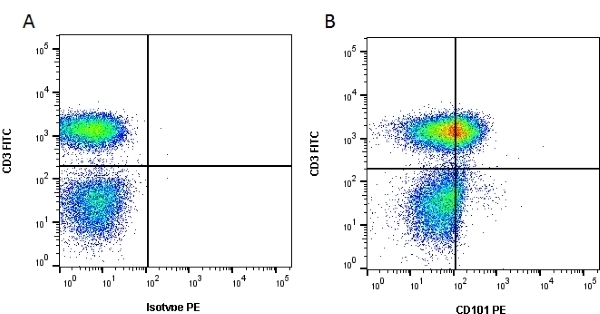 Figure B. FITC conjugated mouse anti human CD14 (MCA596F) and RPE conjugated mouse anti human CD101 (MCA2236PE). All experiments performed on red cell lysed human blood gated on mononuclear cells in the presence of Human Seroblock (BUF070A). Data acquired on the ZE5™ Cell Analyzer. Mouse anti Human CD101 antibody, clone BB27 recognizes human CD101, also known as Immunoglobulin superfamily member 2 (IgSF2), . Cell surface glycoprotein V7, Glu-Trp-Ile EWI motif-containing protein 101 or EWI-101. CD101 is a 1021 amino acid, includinng a 20 amino acid signal peptide, ~140 kDa single pass type I homodimeric cell surface glycoprotein expressed primarily by monocytes, granulocytes, dendritic cells and activated T lymphocytes. CD101 plays a major role in the activation of T cells by skin dendritic cells. Mouse anti Human CD101 antibody, clone BB27 has been reported to inhibit allogeneic T-cell responses (Bagot et al. 1997). Where this antibody has not been tested for use in a particular technique this does not necessarily exclude its use in such procedures. Suggested working dilutions are given as a guide only. It is recommended that the user titrates the antibody for use their own system using appropriate negative/positive controls. Gouttefangeas, C. et al. (1994) Differential proliferative responses in subsets of human CD28+ cells delineated by BB27 mAb. Int Immunol. 6 (3): 423-30. Bagot, M. et al. (1997) CD101 is expressed by skin dendritic cells. Role in T-lymphocyte activation. Tissue Antigens. 50 (5): 439-48. Jovanovic, D.V. et al. 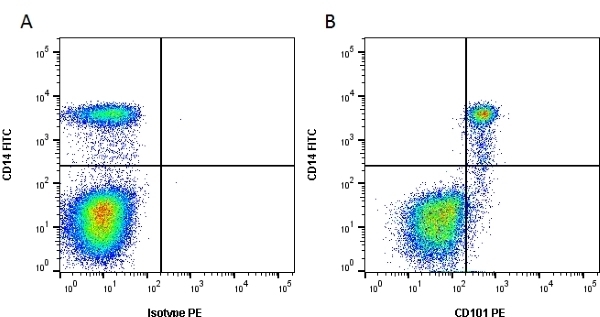 (2011) CD101 expression and function in normal and rheumatoid arthritis-affected human T cells and monocytes/macrophages. Ohradanova-Repic, A. et al. (2016) Differentiation of human monocytes and derived subsets of macrophages and dendritic cells by the HLDA10 monoclonal antibody panel. Clin Transl Immunology. 5 (1): e55. Okuno, M. et al. (2017) Nucleotide substitutions in CD101, the human homolog of a diabetes susceptibility gene in non-obese diabetic mouse, in patients with type 1 diabetes. J Diabetes Investig. 8 (3): 286-94. Grassi, F. et al. (1998) Monocyte-derived dendritic cells have a phenotype comparable to that of dermal dendritic cells and display ultrastructural granules distinct from Birbeck granules. J Leukoc Biol. 64 (4): 484-93.